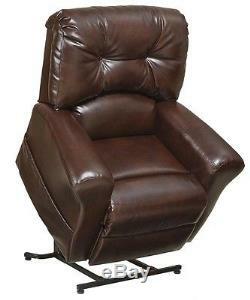 The heavy duty motor and lift mechanism can recline for watching TV or reading, lay back for sleeping, or lift you up to a standing position. This quiet system can lift up to 350 lbs and also has a battery back-up feature in case of a power outage. A convenient hand wand makes the recline and lift functions easy to use. Features include a convenient magazine pocket for convenient storage of magazines and more. The Comfort-Gel seat is 100% gel-infused Memory Foam for superior comfort and a cooler seat. Over 50 independently active coil seat springs are individually wrapped for better distribution of weight. The feet are adjustable to help level the chair to your floor. 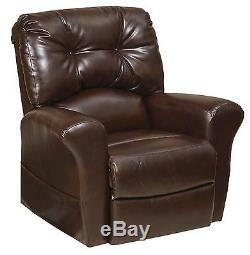 The Landon is upholstered in soft, durable, bonded leather available in 2 colors: Java and Bourbon. Dimensions: 45" H x 42" W x 39" D Seat Height: 20" Seat Depth: 23.5" Seat Width (between arms): 22.5" Weight: 126 lbs. Thank you for viewing our product. 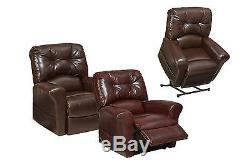 The item "Catnapper Landon 4852 Power Lift Chair & Recliner Java (curbside delivery)" is in sale since Wednesday, June 29, 2016. This item is in the category "Health & Beauty\Medical & Mobility\Mobility/Walking Equipment\Stairlifts & Elevators". The seller is "rlbfurnishings" and is located in Talbott, Tennessee. This item can be shipped to United States.